The satellite menu is a smorgasbord of options, particularly with the introduction in recent years of Ka-band. The search for effective Beyond Line of Sight (BLOS) solutions for governments, particularly in this new world of ever-changing threats is fraught with misinformation and misperceptions. An effective solution is at your fingertips. You may not know about it just yet. With governments as its only type of user community, XTAR has deep expertise in bringing together all the necessary pieces for cost-effective and comprehensive communications capabilities. XTAR’s approach does not fit all user requirements into a single solution. What we provide is a solution that is scalable, modular, portable and versatile. The key is customizing the solution with the right pieces and parts in the right place for the user. XTAR gives you control of your own destiny and does not force you to be defined by someone else’s proprietary solution. Any country, particularly those in Eastern Europe, can achieve self-determination in satellite communications. XTAR makes sense for these governments now more than ever. Many countries in the region – from the Baltics to the Balkans to the Caucuses – need independent, reliable communications that they can design and morph as events may require. 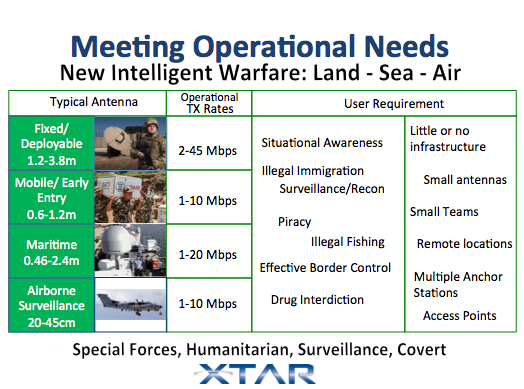 Indeed, XTAR is typically the highest value of all available X-band options. Most importantly, users need a capable and cost-effective solution that fits their goals. XTAR understands governments and military users – they form our entire user base, now and into the future. We are fully vested in the success of the user mission and are able to provide this valuable commodity in support of an independent capability customized to each customer’s unique mission needs.